AC Milan say they "know where the evil comes from" after 18-year-old keeper Gianluigi Donnarumma was left in tears by fans amid reports he wants to leave. The Italian is said to want the deal he agreed in July cancelled, as it was signed under "psychological pressure". 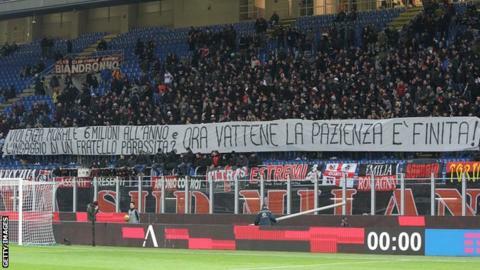 Fans unfurled a banner during the Coppa Italia win over Verona on Wednesday saying they had "lost patience". The club's sporting director said they will protect Donnarumma, but that there is "someone who is damaging our image". Massimiliano Mirabelli added that the club have not met Donnarumma's agent, Mino Raiola and there was "nothing else to say". Donnarumma had looked likely to leave Milan after turning down a new deal in June, but then extended his contract until 2021. "I think that one day he [Donnarumma] will realise what's good and bad," said Mirabelli, who asked fans to "whistle our opponents, not our players." "Gigio has never said he wants to leave. There's someone who is trying to organise something deliberately, but we will look out for Milan's interests in every arena. "Gigio is very young. It's not entirely his fault. We'll always protect him, he's our asset. We know where the evil comes from, we hope to solve this issue over the next few months." The teenager broke into the first team as a 16-year-old, has played more than 80 times in Serie A and won four caps for Italy. Rossoneri boss Gennaro Gattuso also backed his player, adding: "He's not how some people depict him. His team-mates are backing him too, he's a very humble guy."